Since you are without baseball for two days, and you are stuck with political drama on cable news, imagine if Congress had control of the rules of the baseball. The game would look like this. The team in the field would only have a pitcher and a catcher; no fielders. The team at-bat would get 5 strikes and 5 outs an inning. Not worth watching, right? But that is exactly how our politics are played today. 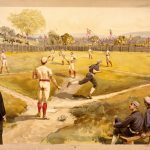 Baseball became America’s pastime in the late 19th Century because it embodies America. Baseball is like no other game; maybe cricket. Football, soccer, hockey, basketball all play on a court or a field that is closed-in. But Baseball is an expansive field. Remove the fences and fair territory bounded by the baselines expands unending. Some say this is symbolic of America’s Manifest Destiny, “Go West, Young Man, staking a claim to the ever-expanding American Dream. But look closely at the essence of baseball to see how ingrained our politics are, or once were, in the game. One hitter faces a field of nine players. The hitter’s goal is to get back home. The nine defensive players’ goal is to deny the hitter. This represents the essence of American conflict and what has made us great. The batter represents the individual, while the nine players on the field represent the common good. Every issue in America is based on these two conflicting ideas: the individual versus the common good. The individual represents freedom. The common good represents responsibility. And when those two are in balance battling each other, our country thrives. But right now we have excessive amounts of individual freedom that overrides the common good, as I mentioned in this post on the latest political crisis. In Strangers in Their Own Land, Arlie Russell Hochschild talks about too many Americans wanting “freedom to do” so they can deny others the “freedom from”. We have special interest groups that voice their political opinions by giving nearly unfettered amounts of money to political candidates leading to income inequality, pollution, expensive and ineffective healthcare, laws helping those who pay big money, and confusion. And what do we get? A large amount of lawmakers who seem clueless to our problems. And how can they? The reason they could become a lawmaker was not knowledge of issues or wanting to serve: it was because they knew how to raise $250,000. In his book, Drain the Swamp, Congressman Ken Buck shares how committee memberships and chairmanships are doled out – by how much money the lawmaker raises. And we have heard numerous stories of special interests writing the bills these lawmakers sponsors and they are entered verbatim according to the special interest’s wishes. The underlying problems are not addressed. We have an aging society. The Medicare expenditures in the next ten years will probably dwarf the military budget. Why is that? The average Medicare recipient has only paid in 1/3 of what they will use over a lifetime. And we have many Americans telling us “Keep your government hands off my Medicare.” Who pays? Taxpayers. Young taxpayers. Which leads to the second problem never discussed. Technology is eliminating jobs and salaries. It is much easier for a company to buy software rather than bring on the headache of a new employee or pay a higher wage. And yet we have tax laws that encourage this. Companies get big deductions for offering health insurance to employees. The higher the premium the bigger the deduction and tax saving for the employer.